The deadline for placing an order is by 1pm Tuesday for delivery Thursday or Friday. 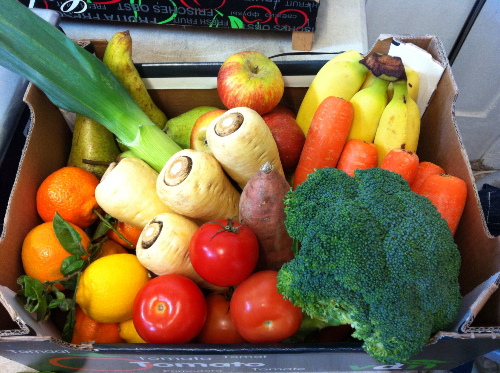 Below is a real life example photo of a £10.00 seasonal veg box with £5.00 fruit added. 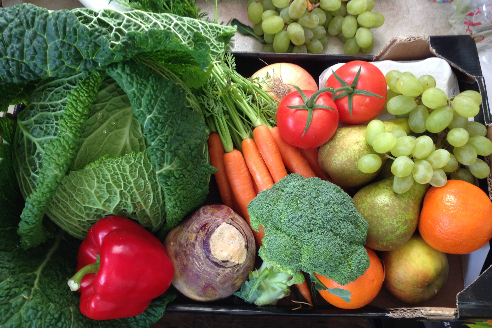 Below Is A Real Life Example Photo Of A £15.00 Seasonal Veg Box With £5.00 Fruit Added. We offer a weekly, free delivery service in Southend on Sea. We supply the freshest, most local and seasonal fruit and vegetables available. The boxes start at £10.00 for a small box - one to two people. Regular fruit can be added to any box. Minimum £5.00 to be added to the box price. Large free range eggs from Tillingham can be added. £2.30 extra. (2 miles north and south of the A13). Delivery day is Thursday or Friday. The way we run the scheme is that we will feature a seasonal vegetable every week which rotates between 3-6 weeks to give more variety. We always include potatoes, carrots, tomatoes and onions as staples. (If you would prefer an alternative to any of the above that can be arranged). There is a list of likely contents below which appears on the registration form. From there on, we ask that you work with the box and see how you get on. You can always tweak it later. Boxes are delivered weekly or fortnightly but there is no long term commitment and you can cancel at any time. If you ever want to add anything to your regular box, you can do this via our online shop > purchase your usual veg box > continue shopping > add extra items > checkout > place order. If you wish to go ahead we would need any changes, cancellations or requests to be made by 1pm on the Tuesday before your delivery. Produce for the boxes is delivered fresh from Spitalfields at 9.30 Thursday mornings. Other local produce, such as Sarah Green's organic vegetable and Benthall Farm's local potatoes, is also delivered fresh that day. Some customers also add half a dozen free range eggs to their regular order. You will see these featured on the attached registration form below. I pay my suppliers upfront and would ask that payment is made the day before, via a bank transfer (or standing order if you wish) or cash on the day, if you will be in. 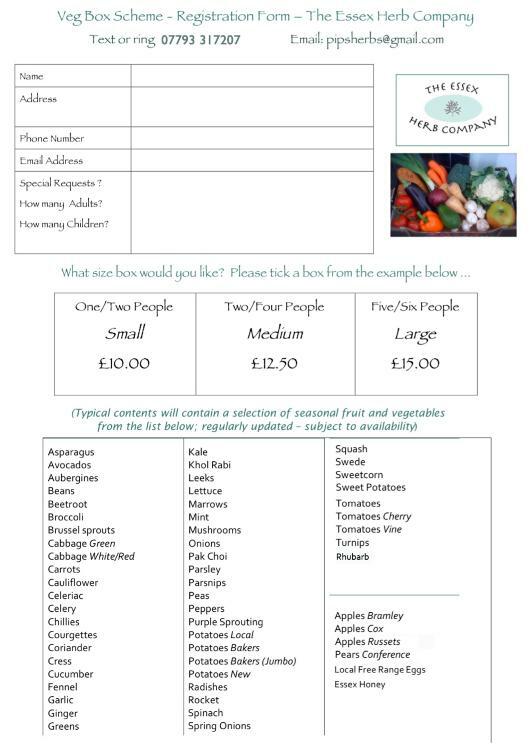 If you purchase your veg box via the online shop you have the choice to pay immediately by Debit/Credit Card or PayPal. The driver would cover up the box and leave in an agreed place should you be out. We use recycled boxes to make up the veg boxes and would ask that you save them for the driver to pick up next time you have a box. (Please only return if clean and presentable - otherwise pop in your blue box). Please print off, scan & email back to me or, alternatively, fill in the Contact Form above and we will email a copy to you. Equally, leave your number and we will ring you to take your details by phone. Post by The Veg Box at The Essex Herb Company.